At Envision Acrylics we turn dreams into reality. We have been working with satisfied customers across the globe for many years and have a well deserved reputation for quality, service, and value. By combining expert craftsmanship with modern materials, we ensure our customers receive superior products held to the highest standards. From concept through delivery, Envision Acrylics can provide every aspect of service throughout your acrylic fabrication project. We invite you to browse our product showroom where you can view our specialized Kreisels (Jellyfish Tanks), Acrylic Aquariums, Vitrines, and Dust Covers. Envision Acrylics provides additional plastic fabrication services, such as cutting, routing, machining, drilling, gluing, and bending. Call us today or click here to submit your plan or drawing for a quote. We don't often get to see the our customers' finished projects, but from time to time one of them sends us a picture of what they have accomplished. 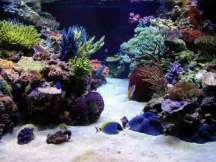 Our feature this month is an 850 gallon reef tank we built for Steve Weast. He recently set it up and was kind enough to allow us to display it here on our website. Thanks Steve for showing us what can be done with a reef tank! Ever wonder what exactly is in the salt mix you are using? In cooperation with Inland Reef Aquaria and Reefs.Org, an analysis of many synthetic salt mixes is taking place to determine just this. Scheduled to begin the first part of February, 2004 is an independent analysis of the many salt brands being used in both public and private aquaria. The testing will compare synthetic salt mixtures with natural sea water in an independent laboratory. The last study of this sort took place several years ago, the details of which can be found at Bingman & Atkinson. Since that time many manufacturers have come and gone, thus synthetic salt formulas have changed and should be thoroughly investigated. 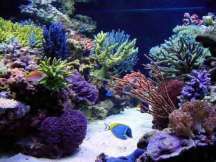 This study may be of great benefit for those involved with aquatic husbandry. The study results will be made publicly available at the conclusion of the testing. An endeavor of this sort requires substantial financial backing. Envision Acrylics, Inc. is a proud sponsor of this study and in late November 2003, donated a 120 gallon aquarium to benefit the program. 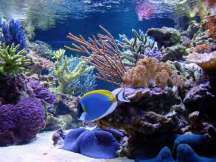 If you would like to donate or seek further information, please check out Inland Reef Aquaria or visit www.reefs.org.